At Holiday Rambler, RVing is more than just a pastime. It’s a lifestyle. And it’s that rambling spirit that draws our owners to the open road for long periods at a time. So we know that every Holiday Rambler must be built to deliver miles — and years — of durability for peace-of-mind and long-lasting reliability. From the ground up, starting with the most trusted motorhome chassis systems, our motorhome construction sets the bar. Freightliner — with its time-tested custom motorhome chassis — has teamed up with Holiday Rambler to provide the Power Bridge® Chassis for our high-end Class A diesel motorhome lineup. This means you’ll ride upon a solid foundation that offers a smooth ride and unprecedented strength during every stretch of road. With a passion to build a dream ride, Holiday Rambler is proud to call Ford its partner. Holiday Rambler builds its Class A and Class C gas motorhomes on the popular and trusted Ford name, and unlike our competitors, we don’t settle for the stock Class C motorhome frame. Instead, we build on a laser-sheared, robotically-welded custom MORryde frame. To further enhance the Class C ride, as well as the Admiral RV, Holiday Rambler partnered with MORryde to introduce the exclusive REV Control Ryde™ system, an industry-first rubber shackle ‘airless’ suspension system. 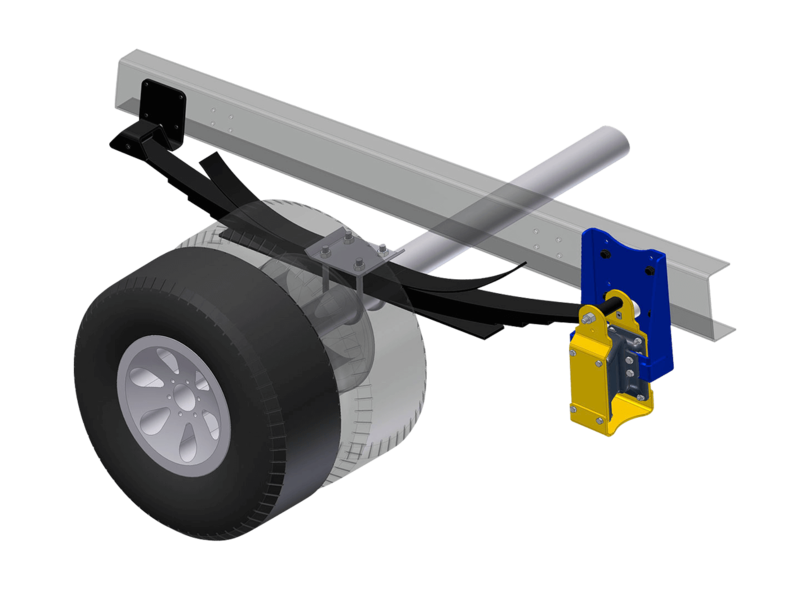 Rubber shear springs work in concert with leaf springs to absorb road shock, and the RCR system features “anti-dive” technology, utilizing a sway bar to reduce front-end dive. Every dream home should rest on a solid foundation, and your dream motorhome should be no exception. From top to bottom, Holiday Rambler delivers ground-up motorhome reliability. Unlike other manufacturers who set their floor on the chassis, we build on a jig-built steel frame for added strength. This raised design also delivers more basement storage. The arched aluminum frame roof with flat ceiling design provides 5” of insulation at the roof peak where the A/C ducts run, perfect for full-time RVers in varying climates who need to maximize insulation. There’s nothing like a good roof over your head. Holiday Rambler features a Tuff-Roof armor skin roof system or a one-piece fiberglass shield, depending on model. Both high-quality roofing systems are easy to maintain. While our motorhomes feel like home, we don’t lean on residential construction techniques. Superior to wood frames, our Five-Point Build System™ is designed for unyielding roads. FIVE-POINT BUILD SYSTEM™: Featuring a steel bridge, aluminum framing, vacu-bonding, interlocking joints and weather-resistant materials, Holiday Rambler uses a durable five-point build system for greater durability. POWERFRAMES AND POWERLOCK SYSTEM™: The Interlocking Powerlock System™ creates a wall-joint system that locks the wall, floor and roof Powerframes™ together for a precise, seamless fit. Gone are the days of stick-and-frame construction. Slideouts create the most livable spaces, but if they’re not well designed, they can lead to headaches. Holiday Rambler avoids issues with intuitive design and durable materials. TAPERED SLIDEOUT BOX TOPS WITH DEBRIS AWNINGS: To shed water away from the slideout seals, select Holiday Rambler models incorporate a tapered roofline and debris awnings to provide added moisture protection. ALUMINUM EXTRUDED SLIDE RAMPS: Most motorhome slideouts are built on pine wood ramps that crack, distort or even rot, but Holiday Rambler builds on aluminum extruded slide ramps for trouble-free, long-lasting operation. TRIPLE SEAL DESIGN: Keep dirt and water out when you close the slideout. Holiday Rambler’s triple seal design removes dirt and moisture thanks to an added seal on the unit and another on the slideout. There’s nothing like curb appeal to make you feel at home, which is why Holiday Rambler has a 125,000-square-foot custom paint facility with six downdraft booths to create stunning exteriors. FULL-BODY PAINT: Increase your motorhome resale value. Instead of the industry standard vinyl and gel coat, Holiday Rambler offers standard or optional automotive full-body paint with UV protection. SEAMLESS BELT TRIM: Other RV manufacturers typically screw on the belt trim dividing the sidewall from the basement storage, but Holiday Rambler’s attractive, seamless belt trim elegantly sheds water to reduce corrosive dirt and water. DRYSEAL™ EDGE COATING: Dryseal™ Edge Coating, a water-wicking wall edge coating, is applied to window frames and the perimeter edge of walls to seal out moisture that can cause swelling, mold and eventual de-lamination. Full-time RVing calls for motorhome construction details that will keep you comfy no matter the season. We use only premium insulation materials to ensure comfortable interiors. TUFF-PEX PLUMBING SYSTEM: Holiday Rambler features the Tuff-Pex plumbing system, featuring Oetiker tubings, fittings and stainless-steel rings, all flexible and durable with sub-zero ratings. SOLID BEAD-FOAM INSULATION: Unlike hand-tucked fiberglass insulation that can sag in between beams over time, Holiday Rambler’s solid bead-foam insulation creates an engineered fit for some of the industry’s highest insulation R-values. FULL-LENGTH METALLIC A/C DUCTS: Instead of cut-foam channels, Holiday Rambler provides insulated, metallic A/C ducting, which runs the full length of the coach, ensuring cool air makes it to the vents and not into the roof. Every dream home needs a decent basement, and Holiday Rambler offers the best in motorhome basement storage space, access and durability. TRUE BUS-STYLE CARGO DOORS: Holiday Rambler uses a seamless cargo door design typically found on Class A luxury motor coaches, which is far superior than the industry-standard “bargain-basement” doors with exposed seals and extruding hinges. EASY-TO-MAINTAIN COMPARTMENTS: From wipeable polyethylene compartments on our economical models to the hoseable Rotocast-molded storage boxes found on the rest of our lineup, these interiors are superior to industry-standard plywood boxes. LARGE STORAGE SPACE: Many of Holiday Rambler’s models feature pass-through storage and lighted compartments, making it easier than ever to locate and access gear in these cavernous spaces.